Trump Sons' Business Travel Is Costly And Complicated : Parallels With the Trump family "so involved in international business, the logistical issues, costs and security risks are more substantial than we're used to seeing," says an expert in presidential travel. 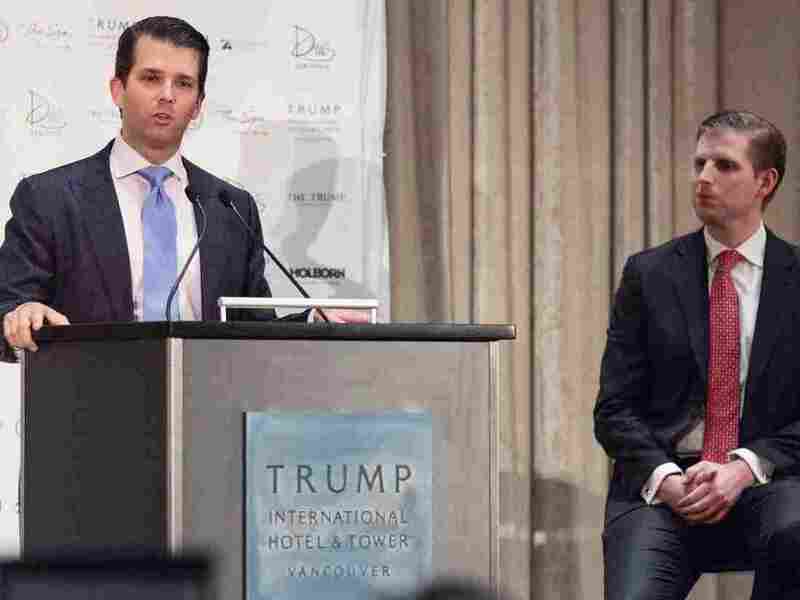 Donald Trump Jr. (left) and Eric Trump attend the inauguration ceremony for the Trump International Hotel and Tower in Vancouver, Canada, on Feb. 28. In early January, Eric Trump took a trip to Uruguay to check progress on an unfinished Trump tower. About a month later, he was in the Dominican Republic, seeing whether an earlier resort project could be revived. He joined his brother, Donald Jr., a couple of weeks later at a ribbon-cutting ceremony for a Trump-branded golf course in Dubai. Then the two popped up earlier last week in Vancouver, Canada, for the opening of a new Trump hotel. Since Donald Trump became president, his sons' business travel has become much more complicated and expensive, especially when the travel is overseas, says Brendan Doherty, a U.S. Naval Academy professor who has tracked presidential travel for more than a decade. He says the president's sons are guaranteed round-the-clock Secret Service protection. Overseas trips usually involve coordination with local security forces, and often, U.S. embassies. "When you have a presidential family like the Trump family that is so involved in international business, the logistical issues, the costs and the security risks are more substantial than we're used to seeing," Doherty says. It's very difficult to get hard figures for the costs for hotels, travel and overtime, Doherty says, especially for the Secret Service. A spokesman for the Secret Service, Joe Casey, said it doesn't talk about its protection operations. The Washington Post estimates that Eric Trump's Uruguay trip cost taxpayers $97,830 in hotel bills alone. 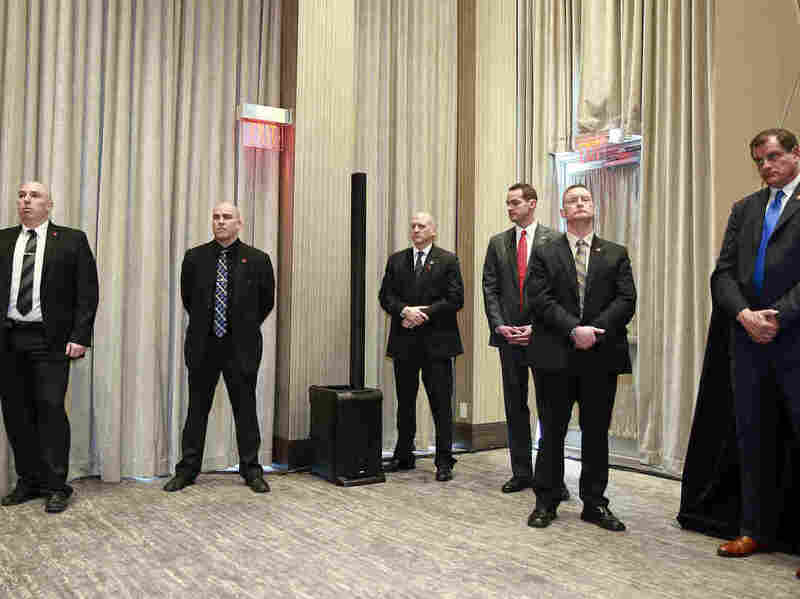 Security personnel look on during the Feb. 28 ceremony opening the Vancouver Trump International Tower and Hotel. Jonathan Wackrow spent 14 years in the Secret Service, including providing protection for President Barack Obama's family. He says it's important to protect the president's children — whatever the cost. "If Eric Trump is traveling and let's say, God forbid, gets attacked and hurt, killed — imagine the impact, the psychological impact, that would have on the president," he says. "So by protecting the children, you're by default protecting the sanctity of the office of the presidency." Robert Gordon, a law professor at Stanford University who specializes in legal history and ethics, doesn't dispute the need for Secret Service protection of the president's family, but he says Trump's sons should start paying for it themselves if they're using it while on private business. "Given that this is supplied to them free by the government, shouldn't they exercise a little common sense and restraint in how far they use this perk?" he says. Tom Fitton, the president of Judicial Watch, which describes itself as a "conservative, non-partisan educational foundation," says voters elected a president who has adult children with thriving businesses. Protecting them — even if they're on private business — is just part of the cost built into this presidency, he believes. "People hired this president in part based on his business success," he says. "There are extra costs associated with that business success as a result." Fitton says it wouldn't be right to suggest Trump's sons should stop conducting business — despite the high cost.